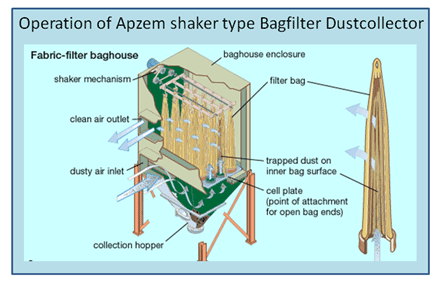 Bag filter | Baghouse ust collectors | Apzem, India. Bag filter & Baghouse dust collectors. Bagfilter or Baghouse dust collector are a giant centralized industrial dust control equipment used for collection and filtration of harmful, nuisance dusts in various industries like cement plants, Fertilizer Industries, Woodworking & Glass manufacturing industries and other Manufacturing Industries. In general Bag house Dust collection system will have one or large number of hoods capturing dusts at different sources, Ducting connecting all hoods and transports the dust laden gas / air to centralized Bagfilter where the dusted air is made to pass through large array of filter bags. The dusts get deposited over bags and only clean air passes on other side. Blower creates the required suction pressure at hood (capturing), Ducts (Transportation) and across dustcollectors (Filtration) and a positive pressure in chimney to exhaust the cleaned air at a allowable altitude. Mechanical shaker type Bagfilter, Reverse air & Pulse jet Bag filters are three types of commonly used Industrial baghouse collectors. All works on the same principle as above and the only difference between them is the method used for cleaning of filter bags. All of the above three, Pulse jet Bagfilter is the most commonly used Bagfilters because of its continuous duty and effective filter cleaning advantages. 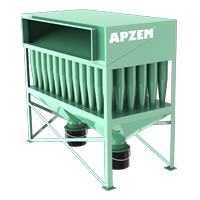 We are the leading manufacturer and supplier of Apzem branded Pulse jet Bagfilter / Baghouse dust collectors. To read more about our pulsejet bagfilter click here. The other less common type is mechanical shaker type collectors. 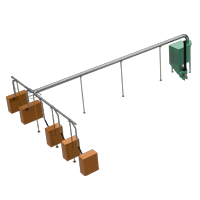 Here either mechanical arrangement with a lever (in case of small Bagfilter) is provided or motorized arrangement is provided that when actuated shakes all Filter bags to remove dust cake build over or inside the bags. Here the system has to be stopped intermittently for cleaning, and applications permitting intermittent stops for bag cleaning and for small to medium dust collection application we recommend Apzem shaker type collectors. For continuous duty and Large dust collection applications we highly recommend Apzem Pulse jet collector type because of it superior performance. Industrial dusts are of different materials and have different physical and chemical properties. Some are abrasive in nature, some are highly combustible and explosive in nature, some are corrosive, and some are sticky and have high moisture content. Temperature, dust loading, grain size & Particle distribution also varies. One dustcollector will not fit for all. Any misconceptions or assumptions of process parameters or dusts will lead to complete failure of the entire dust collection system. 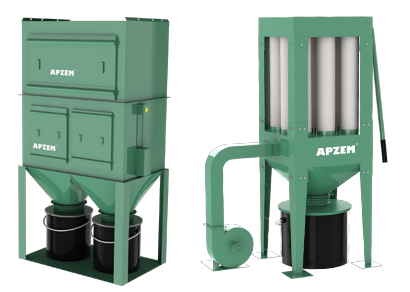 Apzem had a strong team of experienced engineers and experts in designing industrial dust collection system. Our engineers will understand your process parameters, nature of dusts and considers all other parameters in designing a high efficient and economical bagfilters / Baghouse dustcollector system tailor made to your exact needs. All Apzem branded products are build with quality and efficiency complying to national & international quality and emission standards. We also manufactures hoods, ducts, scrubber, fume extractors etc..providing complete solution for all your air pollution control problems.